There was a sea of trees, but one was not like the others. As we left our snack break on Big Huckleberry Mountain and started down endless but gentle switchbacks on the other side, we were still in misty forest with wet undergrowth. Soon we started to pass northbound hikers coming uphill in shorts and short sleeved shirts, in contrast to our rain pants, wind jackets, & hats. Clearly, they were coming from a different climate. We settled into a rhythm of walking through the forest and watching mist roll in waves through the moss-encrusted trees. With the mist so thick, it felt like we were diving down through the base of a murky kelp forest. The peaceful and tranquil surroundings and wide, even trail tread provided a perfect opportunity for some meditative walking. Close up of the crusts on the tree trunks. The difference a few hours and elevation make in the weather. The more we dropped in elevation, the warmer the weather became. We had left the roaring fog behind before the piped spring, and now even the aggressive fog was dissipating. Patches of sunlight broke through the mist and we noticed the undergrowth and ground were bone dry. Suddenly it was a completely different day compared to just a few hours ago on the far side of the slope, and we stopped to remove our extra layers. It was early evening when we reached the final switchbacks and the valley floor. We passed the side trail leading to the Panther Creek campground where the smell of campfire smoke wafted on the air. It is an evocative scent and always reminds me of trips Huckleberry and I took with our girl Sula to the north shore of Lake Superior when she was young, and of the s'mores we would make (puppy s'mores are just graham crackers heated on the fire, she didn't know she was missing out on chocolate and marshmallows that come with the people variety). After an already long day of hiking, part of me was drawn to the campground like a moth to a flame. However, we had agreed earlier to push for the next spot, another 5+ miles down the trail. We continued through a stretch of moss-covered & fern-filled forest, then crossed a few roads before passing between open fields surrounding private homes. These were the first houses we'd seen near the trail. While we understood why they would place no trespassing signs along their property boundaries, it was jarring to walk the narrow trail between two rows of these signs posted on every tree. Dramatic clouds and a golden field at close of the day. We had a final climb along the shoulder of forested Bunker Hill then passed through one last open field. Walking through flat, dry grass felt like such a change from all the trees we have become accustomed to. The sun was partially cloud-covered, giving the golden hour light a bit of extra flair. Near dusk, we hit the final road crossing before our campsite and met five NOBO hikers, who had planned to stay there but said there wasn't room for a group of their size so they were continuing on. We crossed the bridge to find fellow SOBO hiker Maurice (Wrong Turn) camped there, and he pointed out an open space perfect for our small tent on the shore of Trout Creek. There were 3 other tents set up, but Maurice said they were all NOBOs and he hadn't met them. We chatted with him as we set up camp and we dined like Argentines as dusk turned to night. We had just completed our furthest distance hiked, just shy of 31 miles (what running friends would call a "short" trail 50km). We were reminded of our friend YiOu's complaint that "walking takes a really long time" (this came up during a 100-mile race, as a comparison to running), and had to agree with her. We headed to our tent for an after-dinner chocolate bar (the last from my sis) and fell right to sleep, well past hiker midnight. Huckleberry and from whence we came. Huckleberry in action, walking and snacking. Hard to resist with all yhe ripe berries. On Day 29 we managed to be the last folks out of the campsite given our late night, though we were still on-trail by 7:30. We planned a ~20 mile day (spoiler alert- it would end up being closer to 24 miles) including two climbs equivalent to our local Mt Tam (or about 2500' of vert for the non Bay Area running folks). We started up the first hill and stopped at a lookout midway into the climb. It was a sheer drop straight down to a tributary of Trout Creek and we enjoyed a panoramic view of the forested slopes from whence we came. The climb continued steadily on a sweet trail of soft forest duff, switch backing through ferns, moss, and trees. We saw banana slugs again for the first time since we were near the Suiattle River a few weeks ago. Although it was a bright sunny day, the dense shade from the forest canopy made for perfect hiking temperatures. There were very few hikers, which Huckleberry noticed as the day wore on. I was generally preoccupied with the details of the forest. The older trees and snags whispered of their experience through countless ages and many losses. 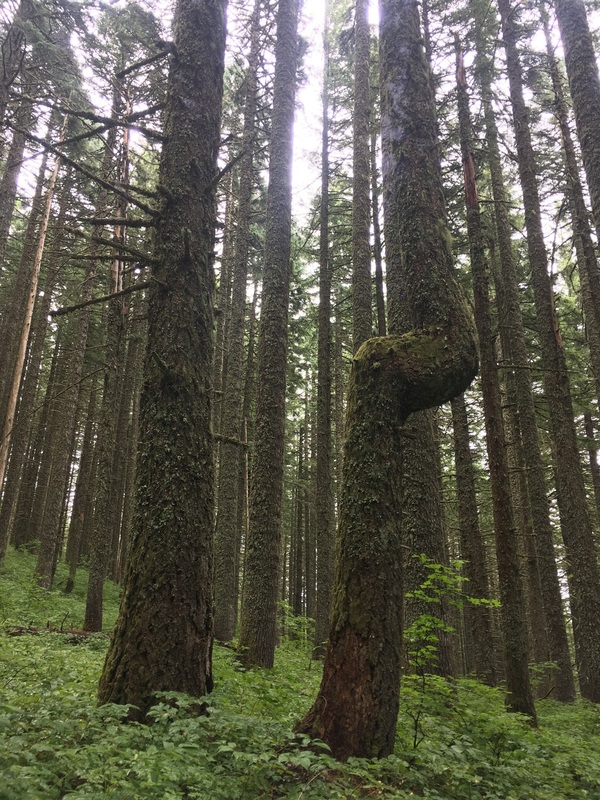 They bore the scars of fire, disease, trail construction, and general human interaction and yet here they were, still living and/or giving life to other forest elements as moss, fungi, or even new trees grew on them. These sentinels of the forest stood watch over our climb. The blast furnace on the PCT. Not quite post-apocalyptic, but you get the idea. On the second climb, we traversed several ridges and got our first real mountain views in days. We could once again see the 4 volcanos: pointy Mt. Hood to the south, Mt. Adams (whose summit was enshrouded in clouds today) and then flat-topped Mt. St. Helens and a distant Mt. Rainier. 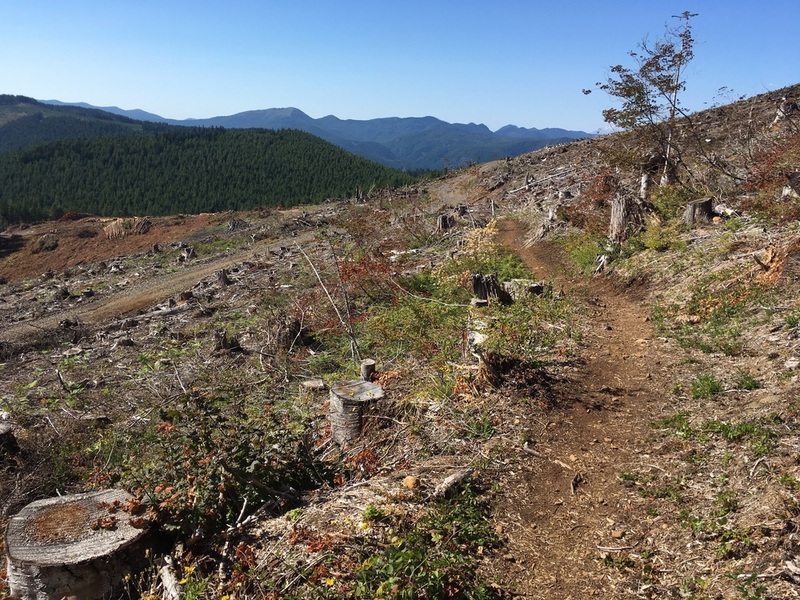 The forest became more open, mostly due to previous logging and incomplete regrowth. On the plus side, we gained the views and plenty of mountain berries including huckleberry, thimbleberry, and black raspberry. Given that we passed through this obviously replanted forest, we should have expected what was around the corner, but it was still a shock. It was late afternoon when we walked onto a recently clear-cut hillside. The temperature immediately increased by 20-25 degrees in direct sun with the heat radiating off of the denuded ground. It felt like walking into a blast furnace, and looked like a desolate scene from a Mad Max movie. There were piles of slashed forest material ready to be burned and huge limbed trees stacked like Lincoln logs ready to be picked up. As we looked across the valley there were much larger areas of clear-cut on the far slopes. 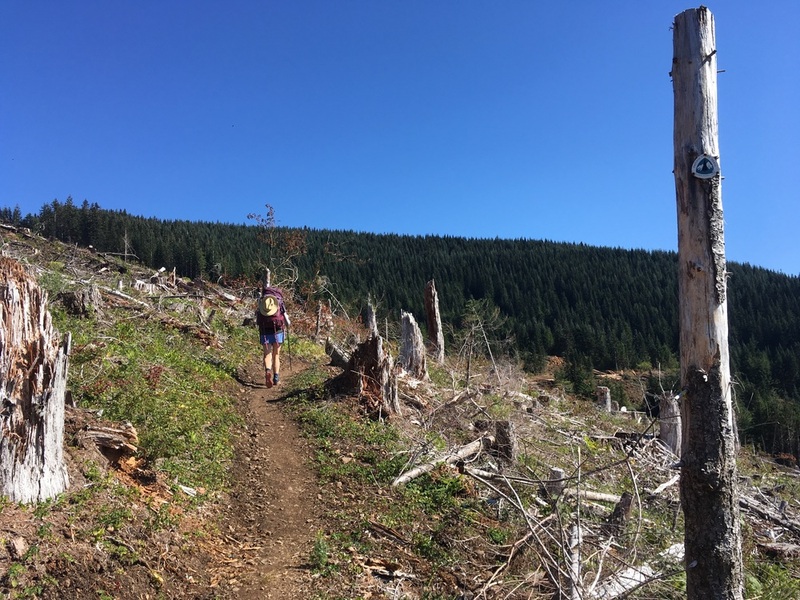 The PCT switch backed through this wasteland for a bit before we passed the pink tape marking "timber harvest boundary" and thankfully re-entered cool, shady, mature forest. Washington had one last surprise for us, as we rounded the corner of the hill we had great views of Mt Hood and the Columbia River Gorge. From there it was a long, steep, loose descent through rocky switchbacks with overgrown & scratchy undergrowth. Stumps everywhere told of the forest that used to exist. Huckleberry joked that it could be worse, at least we were not in direct sun. Then we crossed over to the exposed western slope for the rest of the bushwhacking session and boiled in the heat. (I had said that at least it was not raining/wet, so either way it would have felt miserable). Golden hour in the moss covered trees on the way to our Goldilocks campsite. We reached our first potential campsite and it was empty, but the sites were sloped and the water access was a bit far so we decided to continue ~1.5 miles to the next. When we arrived there the site was vacant, huge, private, and flat but the water access was down a steep gully. The third was another 2 miles down the trail. As Goldilocks said, it was just right (or at least just fine after yesterday's long miles). In any case it was flat, had room for our tent, and had water right next to it. It was also surrounded by what we considered to be quintessential WA forest before this trip - moss covered trees, filtered light, damp and cool air. We had dinner of Idohoans (the last of the stash I picked up at Snoqualmie Pass), miso soup, and an Indian medley of Madras lentils & Bombay potatoes over brown rice and quinoa. Just as we were headed to bed two rather feral looking NOBOs showed up and asked to share our site. We welcomed them and learned that Hare and Tortoise were both med students who had to leave the trail in 4 days to return to school, after a speedy hike from the Mexican border staring May 22. In the small world department, we discovered that Tortoise & I attended the same HS in MN, though many years apart. With a goal of reaching White Pass to end their trip, they were gone by 6:30 the next morning while we had a leisurely start for our easy 6 miles to the Bridge of the Gods, where we would cross the Columbia River and enter Oregon. Macro enjoying fresh fruit in Cascade Locks. Day 30 was another scorcher, and we didn't stay under cover of the forest for long. But we were excited to reach OR and our adrenaline moved us along towards the river. We crossed the highway and walked along the shoulder for a few hundred yards before reaching the bridge, while cars whizzed by. We had to smile when some guys in a passing car rolled down the window to holler "you ARE Reese Witherspoon!" to Huckleberry. It was exhilarating to walk across the bridge, waving to drivers of oncoming cars and looking through the grate at the water far below. On the other hand, it was a bit harrowing as there are only two lanes and no sidewalk so buses are the worst. We still managed to take a few pics. Once in town, we stopped at a little fruit stand for local peaches, apricots (yes, Emily, we found more!) and pluots. We devoured them in short order sitting at a table on the sidewalk, where we saw Dustin and Beanstalk heading for the hiker box at the Ale House. We headed in ourselves for a bite to eat, and to enjoy our legendary free first beer for PCT hikers (we each had a delicious blackberry cider apiece). Our friends Lisa and Kathleen from Oakland very recently moved to the area. So recently, they just unpacked the truck last week. We are excited to see them and spend the rest of our longest town Nero as their very first house guests before hitting the trail tomorrow. In Oregon! 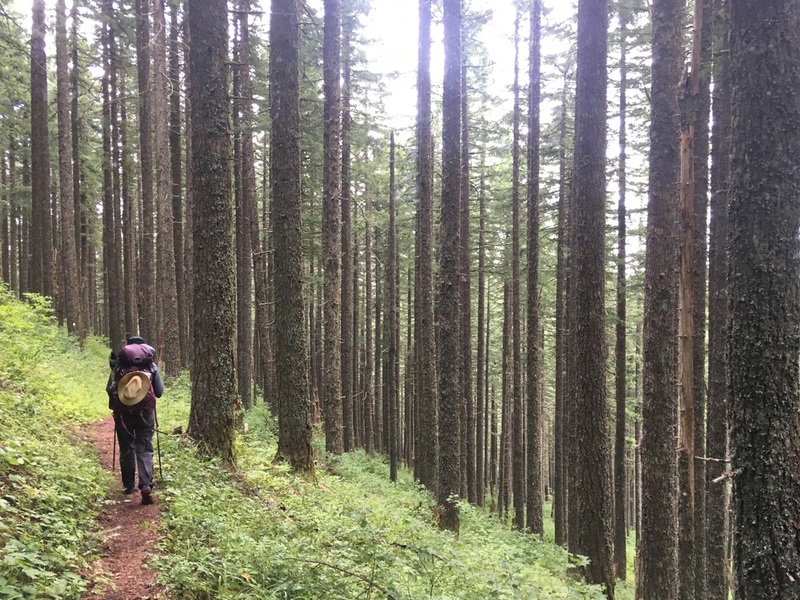 By the Numbers: We've walked across the entire state of WA, crossing through 8 different wilderness areas, 2 national parks, and 2 national recreation areas. Hiking these 548 miles (including 40 bonus miles) took 30 days. Our lowest-mileage day was Day 30, nero-ing into Cascade Locks in 6.1 miles, while our highest-mileage day was Day 28 when we hiked 30.6 miles to camp at Trout Creek. We didn't take any days off, though several days we considered leisurely, spending less than a full day hiking. Our median daily mileage was 18.1. Our highest elevation campsite was Night 3 at Lakeview Ridge (6924'), and our lowest was Night 29 at the base of Table Mountain (911'). We spent 15 nights over 5000', and only 4 under 2000'. We slept indoors 2 nights, and the remainder in our tent. WA doesn't lend itself to tentless camping due to its combination of bugs and inclement weather, but we slept without the rain fly for 7 nights and with a half-fly for 3.